In response to the increasing global energy demand, finite fossil fuel resources and the need to reduce pollution, a great challenge in energy research is the development of new means and materials for energy conversion and storage. The objective of SPINAM is to introduce a new methodology of fabrication and multiscale assembly based on the electrospinning technique to produce innovative energy materials with improved properties. In particular, we will focus on the development of core materials for proton exchange membrane fuel cells (PEMFC) that represent a very promising route for clean energy production. The technique will be later extended to other energy materials in a wider perspective. Significant progress has been made over recent years in PEMFC development. Nevertheless, several technical and scientific bottlenecks remain to overcome before real market introduction, in particular the high costs of materials and production, and the degradation of component materials over time. 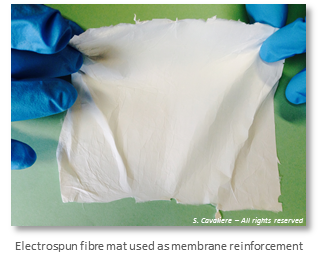 One approach to improve performance and durability of PEMFC is to develop original methods of elaboration of the membrane and electrode materials at the heart of a fuel cell. 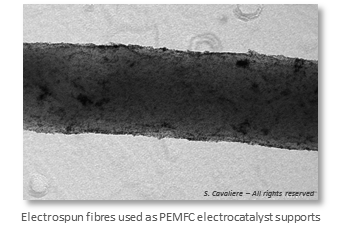 The SPINAM project aims at introducing electrospinning as the key process to elaborate new membrane and electrode materials with a specific architecture for PEMFC. The nanometre size and one-dimensional morphology of the materials obtained by such technique are expected to bring associated cutting edge properties, in particular with regard to directional and mechanical properties, with beneficial effects on the performance and lifetime of the resulting membrane-electrode assemblies. Electrospinning allows to obtain ultra-fine fibres with well-defined diameters ranging from a few nm to several µm starting from polymer solutions. The process, initially developed for polymer materials and recently extended to inorganic and hybrid ones, is based on the electrostatic surface charge on a drop of fluid polymer, which induces the ejection of a jet through a nozzle and the formation of solidified continuous, ultra-thin fibres on a collector. The fibres present high surface/volume and aspect ratios, and improved mechanical strength. Due to its inherent adaptability and applicability, this method can be applied to all stages of the preparation of energy materials, from electrolytes based on organic ionomers, polymers, polyelectrolytes, to electrode materials including catalyst supports based on carbon or metal oxides, nitrides and carbides. The groundbreaking nature of the project consists in the assembly of these materials that will allow development of a new generation of energy materials in which the components are fabricated entirely by electrospinning and with the possibility of scale-up at industrial level.